Advanced Integrated Technologies Inc ( AIT ) assembles and builds systems, tooling, and thermodes for the hot-bar bonding process. We manufacture hot bar bonding thermodes at prices far below that of the original machine manufacturers. AIT can take your bonding application and source and assemble a used hot-bar bonding system complete and ready to go at a price far below that of a new system. 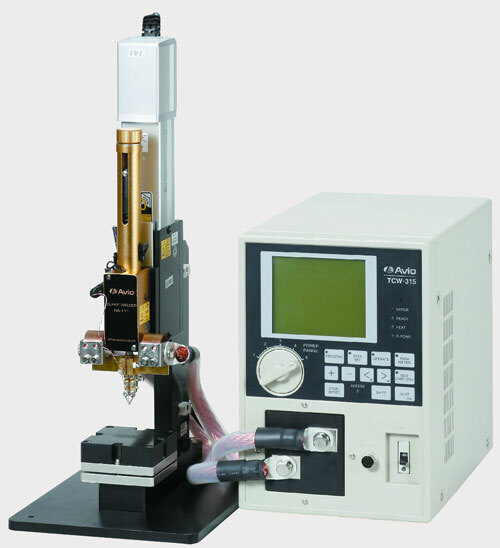 We build tools for all bonding systems including machines made by Miyachi Unitek, Nippon Avionics Co., Ltd (Avio), Palomar-Hughes, MacGregor, and Sunstone Engineering. We are the economical source for thermodes used in all bonding applications. If you don’t see what you’re looking for on our website, call us today. We can build anything you need at very affordable prices. Hot bar bonding is a general category which applies to conductive adhesive bonding, hot bar reflow soldering, heat staking, and heat seal bonding. Hot bar bonding is done using a 'thermode' which is rapidly heated and cooled for making each connection. 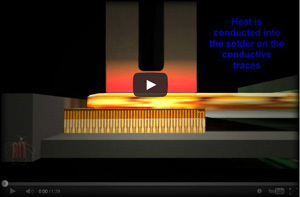 The electrical resistance of the thermode produces the heat necessary to melt the solder or adhesive and create the connection. As the electricity flows through the thermode, the heat generated is conducted directly to the workpiece. Conductive adhesive bonding is a technique for attaching PCBs to displays with conductive adhesive and flex foils. Hot Bar Reflow Soldering is a selective soldering process where two solder or adhesive coated parts are heated to a high enough temperature to cause the solder to flow and re-solidify, forming a permanent bond between the parts. Heat Staking is an assembly process where a piece protruding from one part is fit into a hole in a second part. The piece is then deformed through the application of heat and force (the thermode), forming a head which locks the two pieces together. All of these processes fall within the larger category of hot bar bonding. Advanced Integrated Technologies Inc ( AIT ) has over two decades of experience manufacturing thermodes for hot bar bonding applications at very affordable prices. We manufacture our own versions of the 17TD three dimensional thermode, 17F Multiple Lead Fold-up Thermode, 17BW Multiple Lead Wide Blade Thermode, 17B Multiple Lead Blade Thermode, as well as all other thermodes available on the market today. Over fifty percent of our business is custom thermode work. We are usually able to build custom thermodes at prices even far below the standard thermode prices of machine manufacturers. Many of the designs in use today were originally built and refined by Advanced Integrated Technologies (AIT). Our extensive experience in this field has made us the industry leader in consumable thermode manufacturing. If you are tired of paying high prices for bonding thermodes, call us today and request a quote. No matter what application you have, we can provide the tools you need at a price you can afford.